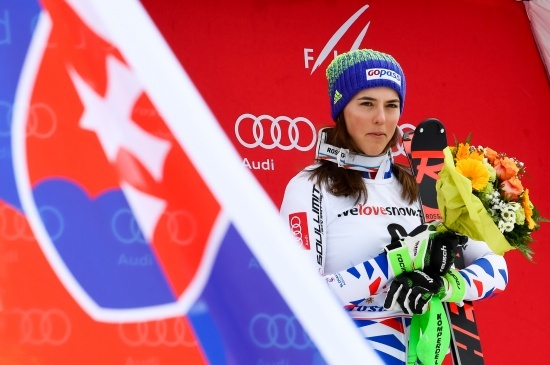 Petra was already happy to bring home a second place, given the gap that 5 gates from the end had from Americans Shiffrin, but fate has wanted to make a mistake for the leader of the world cup and present to our athlete a victory so long sighed by her and from the whole team led by the Italian coach Livio Magoni. A first run under possibility, which sees it end with a delay of 1.12 seconds that seems to preclude the Swiss race, but in the briefing with the team technicians who follow to decide to change setup to have more security and speed. Petra as usual put the skis on his feet, in front of the gate pulls out the grit and determination that sets it apart and concludes an almost perfect manche, you just have to wait for the 5 opponents who will ski after her. One after the other they can not get over our Petra, only the strongest one remains, Mikaela Shiffrin, who after a heats pulled and without smudging, keeping more than a second ahead of Petra, but 5 gates from the finish line makes the mistake more trivial for a skier, dictated by the heat of concluding his own race and made the mistake that giving the second victory to our twenty-two years old skier. Customize here your Soullimit suit!